To the passer by Loch Arthur Camphill Community is a beautifully designed farm shop and restaurant, full to bursting with delicious local produce and home baking, but you need to look closer to get the essence of what this wonderful venture is all about. Camphill is an international movement of communities designed to meet the needs of children or adults with developmental disabilities, through a combination of communal living, the arts and work on the land. There are over 100 Camphill communities worldwide including this one in beautiful Dumfries & Galloway. Chinese whispers were afoot when we visited Loch Arthur- turns out they were expecting some loggers rather than bloggers! Still makes me smile. We were not required to cut down any trees thankfully. Instead we took the weight off our feet in the bakery and listened to the beautifully told story of this very worthy venture. The guys at Loch Arthur started making cheese in 1985 to feed their community from just four cows. As it turned out they were rather good at it and as word spread they realised that there was a market for their produce. Fast forward and here they are producing 6 award winning cheeses plus delicious creamy yogurt from their purpose built creamery. It is fair to say that they have come a long way. 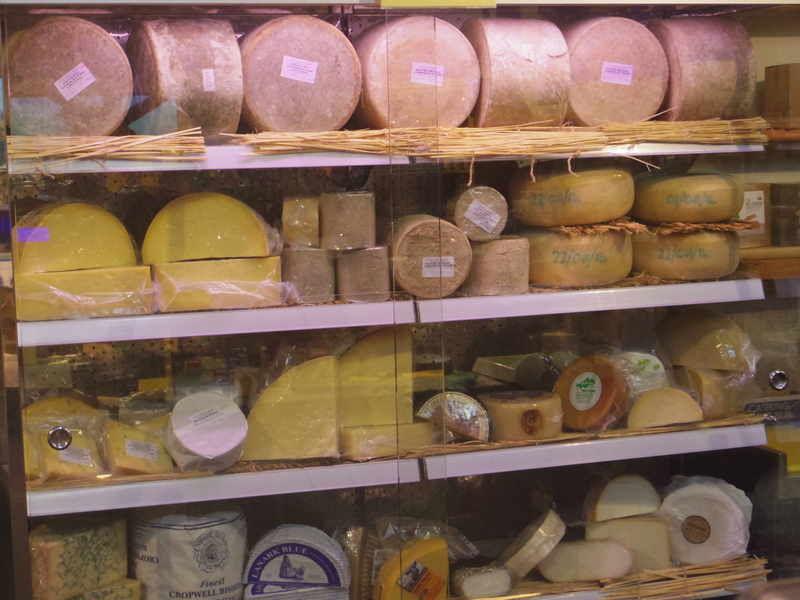 I (of course) bought some cheese. I plumped for the tangy yet creamy CRIFFEL cheese which has a list of awards as long as your arm. It is produced from unpasteurised, organic cow’s milk and it reminded me of a lovely feta. When I got home I had it with a warm lentil and beetroot salad and it was absolutely delicious. The rest of the cheese was inadvertently nibbled into obscurity – lush! The clever people at Loch Arthur didn’t stop at cheese. 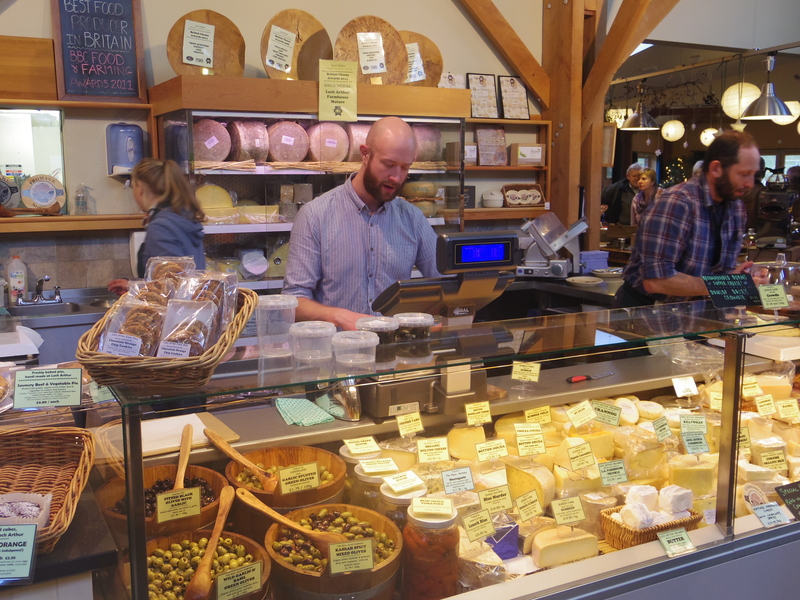 They also have a bakery producing everything from a basic wholemeal to rye bread with caraway, a butchery which prepares meat from their own an neighbouring Biodynamic farms and they also sell their home grown fruit and vegetables. Not forgetting their own chutneys and home baking for the shop and cafe. What started as a very small and rather inaccessible shop has morphed into a large, beautiful and well thought out space which enables you to see the community at work. 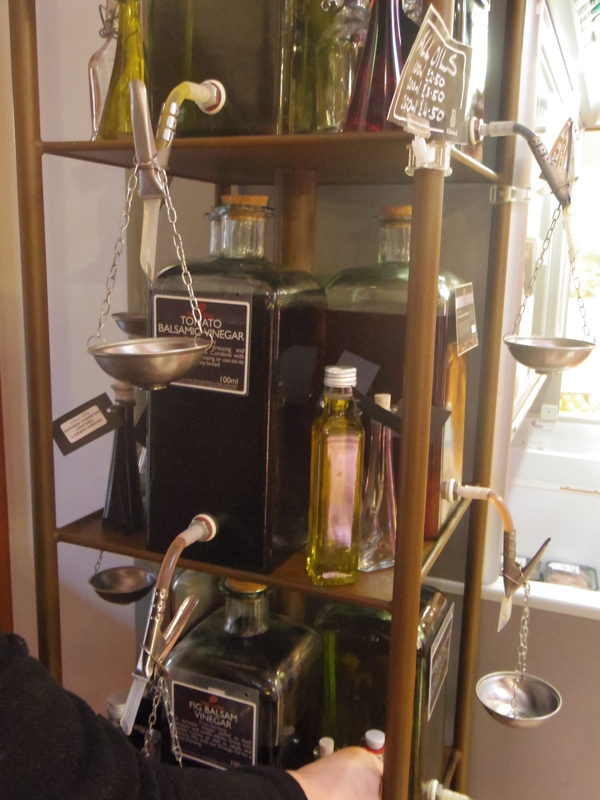 They sell a huge range of products and I was like a kid in a sweet shop. I bought some Roc juice which is so lovely and makes the effort of drinking water much more pleasant, some beautiful organic set honey (banned for the moment due to the diet – grrr), two bars of Montezuma dark chocolate with lime and sea-salt (OMG!) and some chutney made by the folk at Loch Arthur. Some fudge may also have sneaked into my shopping (no self control). This is possibly the foodie highlight of the bloggers weekend for my grumbling tummy. There is something very special about this place which has been run by the Rome family for 200 years. The naturally raised Galloway cattle, pigs and sheep have the freedom to explore the open fields and like the coos at Cream O’ Galloway, their welfare is paramount. I am just going to cut to the chase here and focus on a truly memorable meal. On our fabulous itinerary it stated that we would enjoy soup and sarnies at this venue which I was looking forward to BUT having looked at the menu I did have pangs of longing for some of the other offerings on the menu. So I was grinning from ear to ear when the waitress told us we had free reign on the menu. The world was my oxter! The spacious wooden restaurant has a specialist grill menu which showcases their own meat. 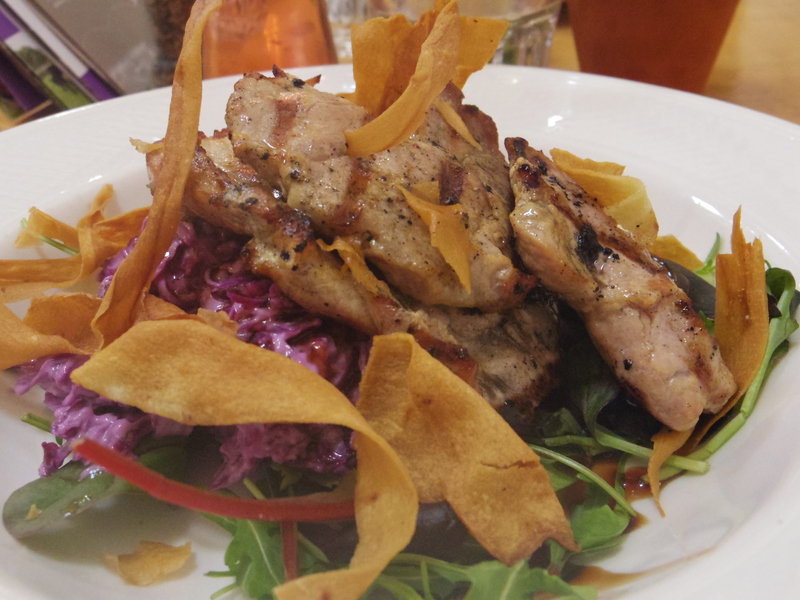 To me “Outdoor Reared Pork with Apple Slaw and a Bundle of Neep Scratching” sounded simply irresistible. What the hell was a neep scratching? I had to find out. This is one of these elegant yet rustically simple meals that I just adore. A homemade creamy slaw topped with the most exquisite piece of marinaded char-grilled pork with crispy shavings of turnip nestled on top. The meat was amazing. Smokey with another ‘secret’ flavour coming through. The slaw added lots of texture and the sweetness of the apple complimented the pork delightfully. I was in heaven! When meat is this good there is no need for it to be hiding in a sauce it needs to just be. 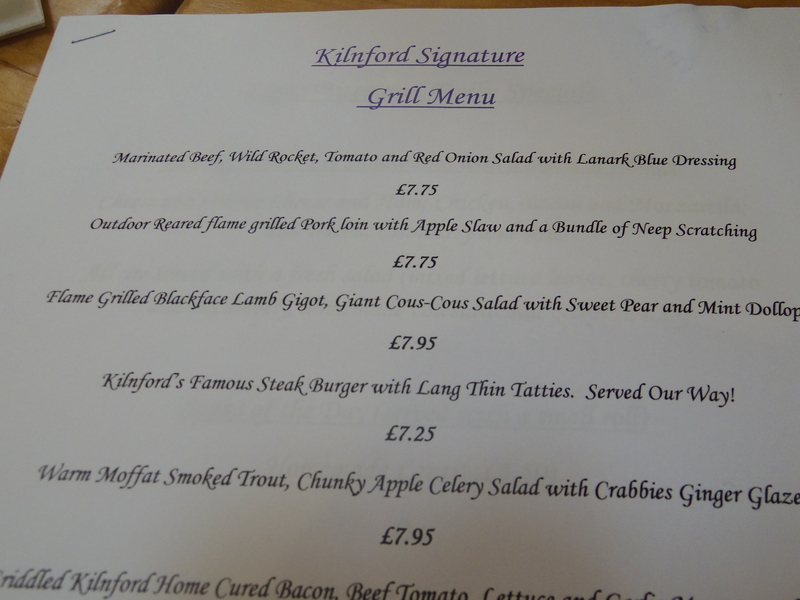 I was told that due to recent laws the guys at Kilnford would have to tell me what was in their secret marinade (although not how it was put together). Some things are better off remaining secret … don’t you think! After lunch, a quick tour and a wee shop I found myself enquiring just how long it would take to drive from Dunfermline to Kilnford Barns, and have decided that for a meal like that it is well worth a bit of travelling. Just need to persuade the Chauffeur. Categories: Uncategorized | Tags: Loch Arthur Camphill Community | Permalink.